Non-contact examination, auto alignment and measurement plus automatic analysis of the endothelium layer make working with the EM-4000 professional and quick (4 sec. for both eyes). Thanks to our auto alignment technology we can assure the reproducibility of the measured area and therefore also the analysed values. The integrated non-contact Pachymetry will be automatically measured with every central examination. The big colour touch screen is used as an operating monitor as well as for displaying all measured values. All commands can be given via touch screen. Wide capturing area of 0.25 x 0.54mm can be viewed utilizing original technologies. The endothelium can be viewed in a wide area of the cornea. Having the patient fixate their eye on the fixation light enables the unit to capture images at 15 points in total. The wide range of capturing positions has increased the change of capturing images on patients with partial cornea opacity. A mark indicating the image capture location can be added to the icon that indicates the selected position of the fixation light. Central cornea thickness can be measured simultaneously. The estimated measurement in the ultrasound mode can also be displayed. Capture errors have been reduced by continuously capturing 16 images with one-time capturing operation. The best quality image is automatically selected and displayed. Selecting the desired image is also possible. Compared to older models, capture, analysis and export can be completed in half the time, resulting in patient comfort. 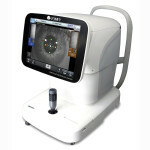 Dark areas, a characteristic diseased condition such as cornea guttata, can be automatically determined and excluded from the analysis results. The dark area ratio (D.A. Ratio) in the area can be calculated and displayed. The main unit alone can perform automatic analysis as it is equipped with built-in automatic analysis software. In the event that the captured image is unclear due to a disorder or the like, automatic analysis may be difficult. Considering such cases, two manual analysis methods have been prepared. A database function is provided in the main unit. Two sets of data can be displayed simultaneosly, allowing you to compare observations before and after surgery for the same patient. Data for approx. 16,000 patients can be stored in the SD card set in the main unit. Performing reanalysis using a different analysis method is possible by retrieving data that has been stored. Displays the endothelium image and the analysis result. An external printer is not necessary, leading to cost reduction.